Cockatiels are about as close to the perfect pet as you can get! With their happy personality and easygoing nature, these attractive little parrots will soon win you over, lavishing you with love and attention! Cockatiels are intelligent and inquisitive. These traits makes them easy to train. Couple that with a very gentle nature and you have a pet bird that that children can safely care for. Cockatiels are considered parrots as can be seen by the shape of their beak. They are members of the Cockatoo family which is apparent by their cute little erectile crests. Unlike cockatoos however, they have long tails making up about half of their total length, and giving them more of a parakeet type appearance. In their native habitat, the arid interior of Australia, cockatiels are quite nomadic. They travel in flocks following food availability. They will temporarily settle in the scrubby low desert vegetation but always stay close to water, such as creeks and rivers. When their food supply dwindles they will then move on. The cockatiel's native habitat has made them well suited as pets. They are hardy, adapt easily to change, and are easy to breed. A big plus is that cockatiels are not noisy and can be left alone for long periods of time. All cockatiels are native to Australia and and live in the subtropics and temperate regions.The cockatiels are found over most of Australia except the coastal areas. They are not found in Tasmania. These attractive little parrots are considered part of the cockatoo family (Cacatuidae). As a member of this family, they display their cute little erectile crests, as well as have their male/female colorings and their nesting behaviors. Young cockatiels are more slender than the adult, have incomplete feathering on the head, extensive barring on their breasts, and pinkish to light gray bills. Young birds reach full size at about 9 months, though they begin to molt at about 6 months and will continue to molt yearly from then on. The adult cockatiel weighs 3 to 4 ounces and is 12 inches from beak to the tip of the tail. The adult generally has darker feathers and beaks. Male cockatiels generally have brighter yellow heads and check patches, as well as prominent crests. Most cockatiels live 12 to 14 years, though they can live as long as 20 to 25 years. In the wild the cockatiel is predominately gray, this is the a normal Grey Cockatiel. The basic pigments in the cockatiel are yellow, red, and black. There have been a variety of color variations, or cockatiel mutations, first occurring in the wild and then resulting in domestic breeding. The first of the cockatiel mutations is the Pied Cockatiel. They have white and yellow spots on their bodies wherever they lack black pigmentation. Pied Cockatiels can be either a light-pied, heavy-pied, or a clear-pied. The second mutation is the Lutino Cockatiel, which is where they lack black pigmentation. The female generally becomes more brilliant than the male. The third mutation is the lovely Pearl Cockatiel like the one seen in the picture above. They have white and yellow feathers with dark gray borders. However the males will molt back to gray, while in the females the coloring holds. The fourth mutation is the Cinnamon Cockatiel, where the black pigmentation turns brown. The fifth mutation is the Silver Cockatiel. This is a paled gray, resulting because the black pigmentation has been partially reduced. It has red eyes and the beak and feet are pink. The Cinnamon Pearl Cockatiel is a double mutation with the coloration of a Cinnamon Cockatiel and the feather pattern of a Pearl Cockatiel. There is also a Cinnamon Pied Cockatiel mutation. The White-faced Cockatiel is one of the cockatiel mutations that lacks the yellow coloration and they have no cheek patches. The males will have a whiter head while the females will have more of a grayish head. The females will also have the barred markings underneath their tail feathers. White-faced Cockatiels come in all the different color varieties like gray, pearl, fawn, pied, and albino. The Albino Cockatiel is a a multi mutation, a combination of the White-faced Cockatiel and Lutino Cockatiel mutations. This bird lacks gray, yellow, and orange and has bright red eyes. The Yellow-cheek Cockatiel is a newer mutation, It has yellow cheeks rather than orange. The Fallow Cockatiel resembles the Cinnamon cockatiel but has more yellow and red eyes. The Emerald Cockatiel, also called the Spangled Cockatiel or Olive Cockatiel, has small patches or splotchings of varying yellow to gray colors. The Pastel Cockatiel looks just like its normal counterpart but the colors, yellows, oranges, browns and grays, are softer. Also its cheek patch is a yellowish orange rather than orange. The Platinum Cockatiel is primarily a light gray with a brownish cast to its chest. The Outer wings and tail are darker. A commercial cockatiel seed mix is generally regarded as suitable along with a good vitamin supplement. Pelleted diets will also provide a fairly balanced feed, however it does not contain the phytonutrients (antioxidant pigments) that are found in vegetables, fruits, grains, and seeds, so should be supplemented. You can supplement your cockatiel's diet with green foods such as dandelion leaves, weeds, carrot tops, celery, watercress, spinach, peas, seedling grasses, and millet. Various fruits will also be enjoyed such as apples, oranges, bananas and others. Cuttlebones are recommended to help provide calcium and to help keep the beak trim. Proteins can be offered in the form of mynah pellets, game bird starter, dog food, and even mashed hard-boiled eggs. Grit should not be provided. Although it was previously thought that grit was needed by cockatiels, it has been found that they do not need grit and can actually cause problems if given to cockatiels. Parrots that eat seed whole without shelling it first require grit, but cockatiels shell their seed before eating it, so don't need grit. Give your cockatiel fresh drinking water every day. You can also add soluble vitamins and minerals to the water. Your cockatiel will enjoy a bath! Bird baths can be either a dish in the bottom of the cage or a light misting with a spray bottle. Cockatiel care also includes grooming. It is important to keep their wings clipped. This will prevent your cockatiel from taking to the air and you never seeing it again. It also facilitates taming cockatiels. Fresh branches from trees and bushes such as oak, maple, and fruit trees will give hours of chewing and climbing pleasure while exercising and trimming the beak and nails. Good cockatiel care will keep your bird healthy and active for years. Fresh food and water must be provided daily. Cockatiels love roomy cages! Cockatiel cages must be at least wide enough for the cockatiel to spread its wings out without touching the sides, so a very minimum of 18" wide by 18" high by 24" length (45 x 45 x 60 cm) is essential. Chew resistant metal cockatiel cages are important, as wooden cages will easily be destroyed. Cockatiel cages with horizontal bars on the sides are nice because these little birds love to climb. Using a cage skirt or fine screen around the bottom of the sides will help lessen seed scattering. The cage bottom can be covered with paper, sand, gravel or a corn cob litter. Place the cage in an area out of drafts and sudden temperature changes. Putting it at eye level or higher will make the bird feel more secure. Covering the cage at night is not necessary but will help to keep the bird calm and give it a greater sense of security. A roomy outdoor aviary (depending on your area) can be a good choice. Cockatiels in an aviary can be housed with some finches and canaries. Do not house with lovebirds, however, as lovebirds can be very aggressive birds. The outdoor aviary needs to have a protected shelter that can be heated and cooled where necessary. The basic cage care includes daily cleaning of the water and food dishes. Change paper bottoms daily and litter coverings every 2-3 days. Weekly you should clean and disinfect the cage. Wash and completely dry the perches and toys whenever they become soiled. Sand floors in aviaries should be renewed annually. Cockatiel behavior can't be beat if you are looking for a sweet beginner bird. Cockatiels are very docile and friendly to people as well as other birds. In the wild they live in groups of about twelve birds, though they will flock in the hundreds after breeding season and where food is plentiful. Consequently they can be housed very well with other small birds of the non-parrot family. They like attention and handling. Both males and females make equally good pets! Cockatiel behavior problems are easily averted if you provide your pet with a stimulating environment and companionship. Cockatiel taming and training cockatiels is easy. Very little time is required for training and cockatiels are easy to handle. Repetition, patience and time are the keys to successful training! Young birds, about 12 to 14 weeks old, are the easiest to train. Cockatiel taming and training is also easier with just a single bird rather than with two birds. This is because at first they will prefer the company of each other over you. When trained by one person, it is important to introduce the cockatiel to other people as well, to avoid it becoming a one person bird. Females are naturally quieter, so training cockatiels to talk works better with males. When taming and training cockatiels, have their wings trimmed to limit their ability to fly. Have one person do the cockatiel training to avoid confusion. If the bird is a biter, stick train it first and then move on to the finger. Taming and training is best done in a small room with few distractions. Training involves acceptance and trust between you and your cockatiel. Speak softly to the bird to calm it and always move slowly. Start from the floor and approach the bird from the side rather than head on. With a treat held between two fingers, coax it onto your hand. It may try to fly and you may have to repeat this several times. Once your cockatiel steps on your hand, you then start having it step up from one hand to the other. If a bird bites hard and persists with biting, say "no!" in a loud firm voice and repeat the training. Repeat the hand-taming lessons several times a day but for short periods of time, about 20 minutes a session. Most trick training is accomplished with food rewards. Some of the more advanced training includes climbing ladders, ringing bells, and spreading it's wings. Cockatiels are more adept at learning beak tricks than claw tricks. Cockatiels have high pitched voices and are not the very best talkers. But they can be trained to talk with lots of patience and repetition. For help with tricks and training, try Chet Womachs Parakeet/Cockatiel Training Course. For speech training try Teach Your Parrot to Talk. Cockatiels love climbing and stretching their wings, as well as playing. Keep the quantity of toys and accessories in the cage light so that you don't inhibit the bird's movements. They enjoy a variety of toys such as seed treats, swings, ladders, bells, and mirrors. Tree branches and wooden chews provide excellent exercise and keep the beak trim. Bright shiny plastic toys are for parakeets, not cockatiels! Never give them rubber toys! A tame cockatiel will enjoy a playpen outside of the cage. It makes a superior cockatiel toy and can be equipped with ladders, perches, swings and hanging toys. 10 to 12 hours of rest are needed each day for a healthy, well adjusted cockatiel. An excellent breeding choice because cockatiel is on of the easiest of the parrots to breed in captivity. In the wild, cockatiels will often pair for life, building their nests in tree hollows about 6 or more feet above the ground. For cockatiel breeding, a good size breeding cage is 48" wide by 48" long by 24"-36" high (120x120x60-90 cm high). The recommended nest box size is 12" wide by 16" long by 12" high (30x40x30 cm high) with a 3" hole. The box should have an inch or two of wood shavings or pine bedding in the bottom. Birds should be 18 months to two years old to begin cockatiel breeding. Keep in mind that pet cockatiels can often become aggressive toward you during breeding. Mating can be immediate or may take up to 4 to 6 weeks, during which time there will be a lot of mutual preening. The female will lay an egg every other day for a clutch of between 3 to 9 eggs. The incubation period is 18 - 20 days. The chicks will begin to leave the nest at about 5 - 6 weeks and will be totally independent about 2 weeks after leaving the nest. The cockatiel health is easy to maintain as this is a very hardy bird. However, there are signs of illness to be aware of. You should be concerned about your cockatiels's health if the bird shows a lack of activity, the feathers are ruffled, or if it shows any signs of weight loss (weight loss can be quick and fatal). Some of the common illnesses and injuries your cockatiel could contract are broken wings or legs, cuts and open wounds, overgrown beaks and nails, lameness or sore feet, feather picking, feather cysts, weight loss, heat stroke, shock, concussions, egg binding, indigestion, eye disease, mites, watery eyes, colds, tumors, Psittacosis, coccidiosis, French molt, goiter, E. coli, Aspergillosis, conjunctivitis, constipation, diarrhea, arthritis and rheumatism. Set up a hospital cage where you cover all but the front of the cage and add a light bulb or heating pad to keep the interior cage at a recommended constant temperature of 70 degrees Fahrenheit. Remove all perches and put food and water dishes on the floor. If you don't see improvements within a few hours, an ailing parrot should be taken to a avian veterinarian for diagnosis and treatment. Behavior problems in birds usually stem from something missing in the bird's environment. Many birds in the Cockatoo group are particularly vulnerable to feather plucking because of their intense need for socialization. Boredom, lack of trust, lack of interaction with other birds or people can lead to problems like biting, feather plucking, and screaming. Try to develop a bond of trust and spend time with your bird to help avoid these problems. We have also had good success with Chet Womach's Parrot Training Course. He offers free 3-day introductory course so you can try it out before you buy anything. You can readily find cockatiels for sale in their natural gray coloration as well as the cockatiel mutations. Cockatiels are a fairly inexpensive little parrot. 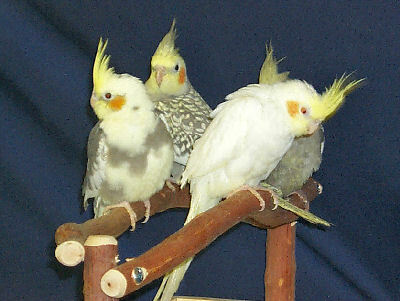 The Australian government instituted a strict ban on the export of these native birds in 1994, consequently, all the cockatiels in the United States are from captive bred stock.